Earlier this week, we announced the Twins Daily Minor League Hitter of the Month (Alex Kirilloff). Today, we discuss some of the top relief pitchers in the Twins minor leagues in August. I’ll be honest, even with the honorable mentions, there could have been even more. But when we get to the top of the list, you’ll fully understand the choice. You’ll also get to learn a little more about some guys you may not know as much about. Before we share our choices for the Twins Minor League Top Five Relievers for August, here are some terrific bullpen performances that just missed the cut. Colton Davis, Ft. Myers Miracle, 8 G, 2.19 ERA, 1.14 WHIP, 12.1 IP, 6 H, 8 BB, 17 K.
Ryan Eades, Chattanooga Lookouts/Rochester Red Wings, 9 G, 3 GS, 1.00 ERA, 1.11 WHIP, 18.0 IP, 15 H, 5 BB, 22 K.
Ryne Harper, Rochester Red Wings, 9 G, 3.06 ERA, 0.91 WHIP, 17.2 IP, 13 H, 3 BB, 21 K.
Jovani Moran, Ft. Myers Miracle, 8 G, 3.12 ERA, 1.10 WHIP, 17.1 IP, 11 H, 8 BB, 23 K.
Quezada signed with the Twins way back in 2012. He was a skinny kid. Since then, he has grown to 6-8 and over 240 pounds. He was posting upper-90s velocities until shoulder problems cost him the 2017 season. He returned this year and got into some games in Elizabethton. However, he has done a nice job since joining the Kernels in the middle of August. Recent reports had him hitting 99 mph again. He is already 24. He signed a little later and the shoulder issues have cost him time, but he is certainly one to watch over the next year as he could move fast if he can stay healthy. In August, opponents hit just .209/.261/.233 (.493) off of him. Lots of talk about Byron Buxton, and deservingly so. Because he’s one of us and struck out a ton of batters in Rochester this year, we also hear a lot, wondering why Nick Anderson wasn’t promoted. However, it is inexplicable to me that Jake Reed didn’t get called up for September. They were fortunate that he wasn’t selected in the Rule 5 draft a year ago. After this season, it’s much more unlikely that he would again. His season started out slow, but since June 1st, he has a 1.43 ERA and 38 strikeouts in 37 2/3 innings. August was his best month as he didn’t give up runs, didn’t allow base runners and even walked less than he did over the course of the season. Opponents hit just .143/.234/.167 (.401) off of him in the month, and he missed a lot of bats. While he can occasional struggle with his control, Derek Molina is very intriguing because he misses a lot of bats. And, he’s only been pitching full time since the Twins made him their 14th-round pick in the 2017 draft out of Merced College in California. In August, things came together nicely for him. Opponents hit just ..146/.196/.188 (.384) against him. Molina throws a good fastball, a solid curveball and an improving changeup. Check out this Q&A with Molina from earlier this season. Three rounds after taking this month’s top reliever, the Twins selected his Westmont College teammate Hector Lujan. Lujan had a terrific 2017 season in which he led the Twins minor leagues in saves for the Cedar Rapids Kernels. After a slow start with the Miracle this year, he really came on strong. August was easily his best month. His control improved and his stuff definitely helped him miss bats. For the month, opponents hit just .133/.170/.200 (.370) against him. He will participate in the Arizona Fall League this year. Andrew Vasquez pitched in the Florida State League All-Star Game in mid-June. Following the game, he was promoted to Double-A Chattanooga. He spent almost exactly one month with the Lookouts before being promoted to Triple-A Rochester. He spent about eight days with the Red Wings, and following the August 31st game, he was told that he was heading to the big leagues. As we have seen in his two short appearances with the Twins, Vasquez is primarily a slider pitcher. His fastball sits 89-90 mph, but it is his breaking ball that can be absolutely devastating to opposing hitter. A quick look at his above-mentioned stat line for August, he averaged over two strikeouts per inning. In August, opponents hit just .157/.259/.176 (.435) off of him. Vasquez was the Twins 32nd-round pick in 2015 out of Westmont College (after three years at UC-Santa Barbara). He went to the GCL that year where he walked 15 batters (and struck out 22) in 12 1/3 innings. He was moved along slowly as he worked through his control issues. But once he had command of his control, he flew up the system. This year, he has 108 strikeouts in 69 1/3 innings. He was an easy pick to be added to the 40-man roster in the offseason, so the Twins brought him up for September. There were several strong relief pitcher performances in August throughout the Twins minor league system, and at least another handful probably could have been mentioned. It was a good month for each of these pitchers mentioned today, but it was a great month, which culminated in his first big league call-up. 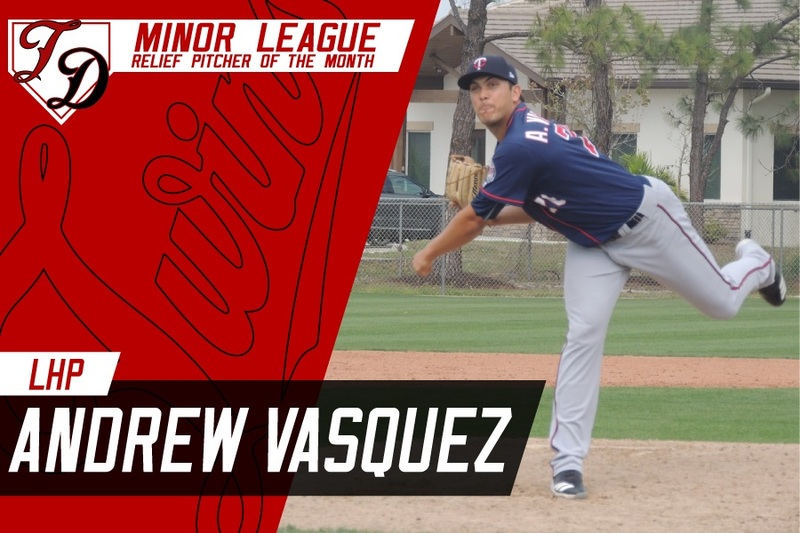 Congratulations to Andrew Vasquez, the Twins Daily Minor League Relief Pitcher of the Month for August 2018. Hoefully, Vasquez can develop into that big time lefty set-up guy like Brad Hand or Miller.With his rapid rise thru the organization this year, expect it could be a year or two before he really settles into what he can be. Was wondering about your comments about Reed, Seth.There seem to be several pitchers/relievers who are on the 40-man bubble (Reed, Jay, Anderson, others).Can understand their not promoting him if he is one of them.But agree that he is deserving and there is a good chance he is gone in December if not added. Ryan Eades won't ever make it to the Twins, will he?Is he a minor league free agent this year if he goes unselected in the rule 5? I am sorry the Twins are doing so well that they could not have this group all audition in September, but with Belisle eating up all the Relief Innings what could they have done? Sorry, I think I am starting to get bitter. So, according to the FO, there are "playing time concerns" for Buxton.But last night Mollie trotted out Grossman and something called "Johnny Field".The MLBPA is going to be all over that.We also apparently don't have enough innings to audition guys like Anderson and Reed b/c.....what, we want a good look at Matt Belisle?? ?I'm a patient guy.A diehard, lifelong Twins fan.But the FO is going to really try fans' patience with these type of decisions. I'm making an assumption that the Twins have already decided the Anderson and Reed will be added to the 40 in November and they don't need to further evaluate them. But they're using September to give a few other guys evaluation time to see if they'll stay on the 40. I could, of course, be wrong. Eades is solid. He won't' be a free agent until after next year. The Twins have a luxury of arms. Too many. Be interesting to see who they do add in 2019. I think they need to make hard decisions on the likes of Duffey, Curtiss, Slegers, Busenitz before going in the off-season. Additions by subtractions will happen. Priority #1 is to choose the pitchers that have a good chance of making the Twins in 2019. Any others will fight for 40-man spots with possible callups next season...and in the more distant future. Eades, like Baxendale, and before them Hurlbut, needs to move on, sadly. No chance with the Twins. This is when they should'be given him a look, and the Belisle roster spot makes one wonder. Even Luke Bard, who didn't have the best 2018, should be getting the Belisle innings. But like all of us here, we domn't make the real decisions, do we? Like it or not, the team probably wants to see what they have in Field. They know what they have in Buxton... even if Buxton is better. Again, I don't feel sorry for Byron here. He's been pretty bad, and certainly not deserving of a callup. Like it or not, the team probably wants to see what they have in Field. Mission accomplished. Have the Twins send my usual consulting fee* to my usual address**. Don't forget Ollie Drake.... I mean he is only 31 years old and on his 5th team of 2018 and all, but who knows maybe he can turn it around and have a real part in the future of this team. Jake Reed: since June 1st, he has a 1.43 ERA and 38 strikeouts in 37 2/3 innings. August was his best month as he didn’t give up runs, didn’t allow base runners and even walked less than he did over the course of the season. Opponents hit just .143/.234/.167 (.401) off of him in the month, and he missed a lot of bats. DJ Baxendale: since June 1st, he has a 1.43 ERA and 38 strikeouts in 37 2/3 innings. August was his best month as he didn’t give up runs, didn’t allow base runners and even walked less than he did over the course of the season. Opponents hit just .143/.234/.167 (.401) off of him in the month, and he missed a lot of bats. But noooooo.... we can't see any of these guys. We get Belisle, and Ollie Drake and more Addison Reed- even though he's either injured or completely gassed and needs a DL shut-down. Cripe, Nick Anderson is 28, he has no time to lose. Don't you wanna see how his stuff plays against MLB hitters? I do, no matter the result. Is MoY still under the delusion of catching Cleveland? This is September in a long-lost season. We don't need to see more of the same that got us here. Very happy, and a bit surprised, to see Vasquez being promoted so rapidly and getting his September shot. Despite his milb numbers and great slider, I have to wonder if he's more of a great LOOGY rather than a set-up guy. Haven't given up on Moya yet. Still have a feeling Mejia will be in the 2019 pen with Rogers from the port side. And that could be a devastating 1-2 punch, potentially. I don't care if the FO likes Reed and has already decided to add him to the 40 man. If you're going to add him, then just add him now and let him gain some experience! We are doing what with Belisle? Auditioning him? Quezada had 3 K's in 12 pitches the first inning of relief tonight, and one more in the scoreless second inning. Based solely on performance, Buxton deserves to be sent home.Based on how badly the Twins need him to produce next year, I thought they should have called him up.By all accounts, he is a tireless worker, so I don't think it's a lack of effort, so I don't know if "punishing him" is the best move.Like all these kinds of decisions, none of us really know how it's going to work out.I do know that if Buxton (and Sano?) can't become at least a solid big-leaguer, the Twins are MUCH further behind in the rebuild than we all thought.